A sample of the new school uniform is now available for students to try on in school. 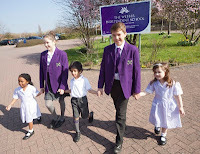 Uniform may be tried on before or after school until the end of term and during the summer holidays families are welcome to visit on weekdays between 9am and 4pm. Please contact the school office in advance to let us know you are coming. The new uniform can be ordered from DJ Uniforms. All orders must be placed on the DJ Uniforms website or in their shop, no orders can be taken by school. Please ensure you select the option to have your uniform delivered to school to obtain free delivery. The school office will call you when your uniform is ready for collection. Last Friday, 29th June, Year 7 went to the City Discovery Centre (CDC) and Great Linford village. At the Discovery Centre they were introduced by the education officer Kim Davies to the history and geography of the village and the City of Milton Keynes. Among other interesting facts we learnt from our talk at the CDC was that Milton Keynes already had a population of 60,000 in the towns and villages before the new town. Many visitors from China come to the City Discovery Centre to learn from Milton Keynes experience in building their new towns and cities. Great to think that Milton Keynes is having an influence on the world's second biggest economy! We were then were given privileged access by an archaeologist from Buckinghamshire County Museum to the ancient past of Milton Keynes and Great Linford.